I don't know about you but Kevin likes to hunt. If I would let him I'm sure he'd like to put animal heads all over our house like one of our Bishops' house in Utah, now that guy was a hunter! 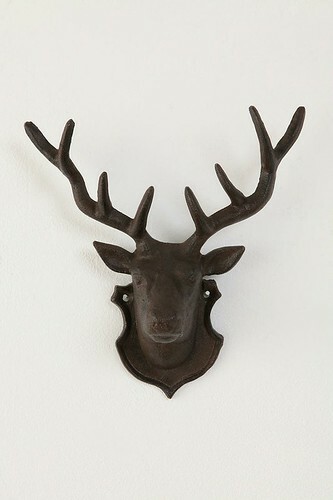 Recently, I've been seeing fake deer heads all around! 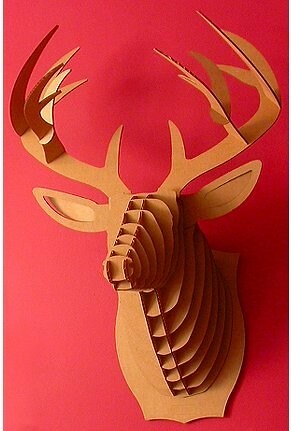 With that said, I think I can make a good compromise and get a fake deer head! And hey they are super stylish right? 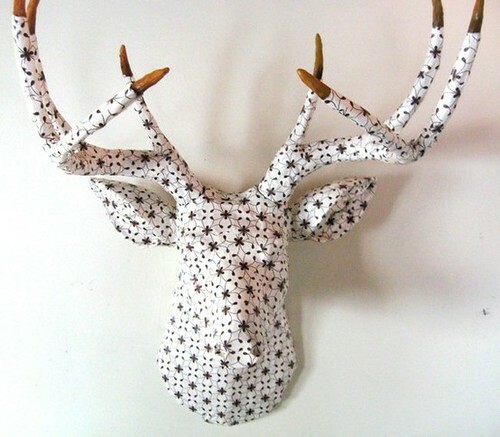 Some of the deer heads cost hundreds of $ and some have tutorials to make them for cheap! Go ahead and check them out, if you're a fan like me! 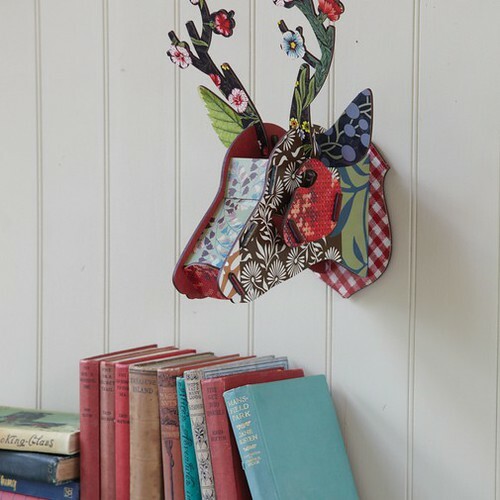 Are you a fan of fake deer heads? I hope to get one soon-ish! Also, if you LOVE The Hunger Games don't forget to check out my book club here! Hmmm. I'm partial. I liked the white one with the jewelry hanging off. 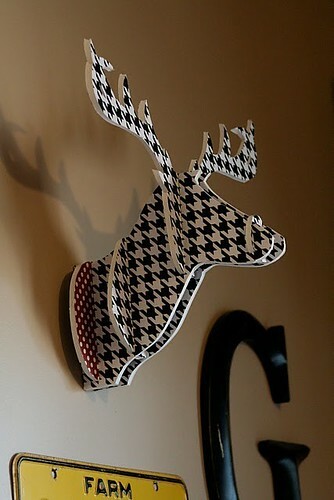 And the houndstooth one. i saw one at Quilted Bear for way cheap...i should've bought it! blast! i am so with you--have been wanting one for a while! those are all super fab! That don't bother me but I am not sure if I would ever have one up in a room. I think if I had the right decor it would work! The other day I told a coworker that I wanted a deer head, not a real one a fake one. 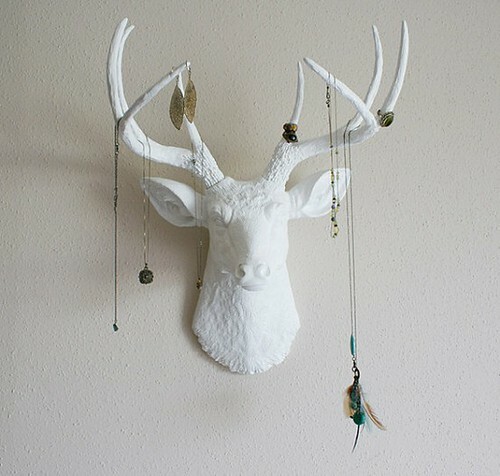 Then I get on pinterest last night and saw all your deer head pins and thought "yes!!" hmmm...well i thought i hated them, as in they were way too creepy to have in my house, until i saw the ones you've found...some of those are actually super adorable. and ashley I LOVE the new layout! its so cute..simple, yet stylist. i'm a huge fan. I'm a fan for sure! This is perfect timing for you to be wanting one too...since Christmas stuff is on sale go get a reindeer figurine for super cheap, cut off the head, and modge podge it with whatever pattern you want! 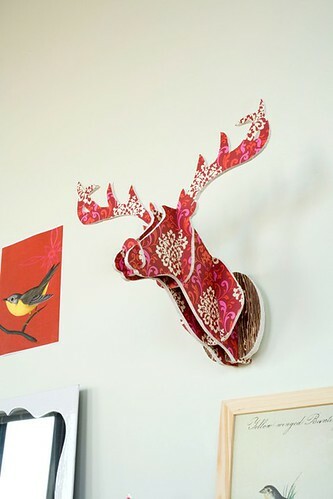 Insta-deer-head for super cheap! Those are some of the prettiest deer heads I have ever seen! 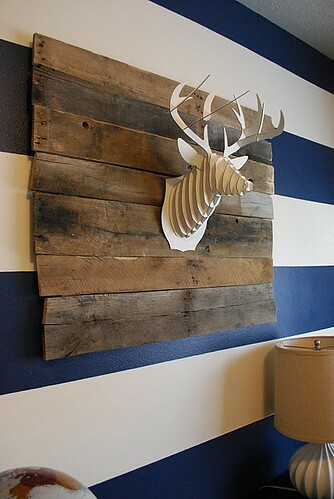 Ooo I could put one in my office and hang my jewelry I make off it. Thanks for the inspiration! Ohh they're cute but I don't know about having one in my house. I would definitely not pay $$$ for them. the deer head trend is growing on me for sure! and i love some of the ones you posted definitely!! Just found your blog randomly through bloglovin'. Love it, so if you find comments on a post from like, last week, it's just because I feel the need to catch up. I haven't actually seen these things anywhere, but I live in Germany, so that could explain that. They're definitely interesting. I don't think I'd put one in my house, but they are pretty fun, and way less creepy than the real things whose eyes seem to follow you everywhere you go! I'm obsessed with the third one down. I had that on my Wishlist on my blog! Love em...now only if I could figure out how to make one myself! I love the first one! i have never even seen those before!!! Look like a good year. 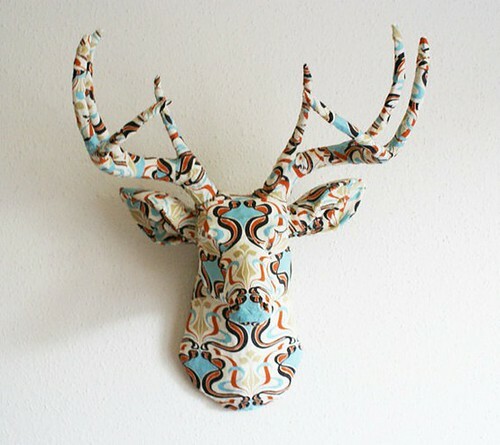 I like the deer heads. 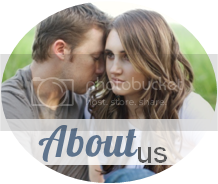 Nice blog.